The Java String Replace function is one of the Java String Method, which is used to search for specified string and replace the searched string with newly specified string. In this article, we will show you, How to write String.replace method in Java Programming Language with example. Before we get into the example, the basic syntax of the String.replace in Java Programming language is as shown below. The Java Programming Language provides String.replace Method to replace the existing char or Character Sequence with user specified char/Character Sequence. Java String.replace Method will accept two types of arguments. The String.replace function will accept two character arguments, first argument (OldChar) is the character existing in the String_Object, and the second argument (NewChar) is the character that you want to replace with. For example, if you want to replace the y character with z in a string “Jayy” then you have to write Jayy.replace(‘y’, ‘z’) to get the output Jazz. The Java String.replace function will accept two Character Sequence arguments, first argument (target) is the substring existing in the String_Object, and the second argument (Replacement) is the substring that you want to replace with. For example, if you want to replace the Substring Programming with Language in a string “Java Programming” then you can write “Java Programming”.replace(“Programming”, “Language”) to get the output “Java Language”. String_Object: Please specify the valid string on which you want to perform Replacment. NewChar: Please specify the valid new Character you want to insert into String_Object. The Java String replace method is used to replace the existing substring with user specified new string in a string object. 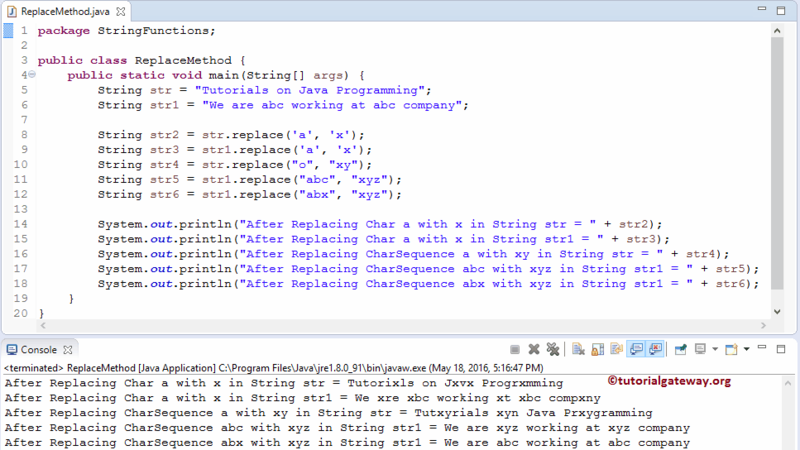 This Java program will help you to understand the Java string.replace method practically. The following statement will call the public static String replace(Char OldChar, Char NewChar) method to find the character ‘a’ and replace it with ‘x’. The following statement will call the public static String replace(CharSquence Target, CharSquence Replacement) method to find the sub string ‘abc’ and replace it with the substring ‘xyz’ . In the next line, we are tried to replace the non-existing sub string ‘abx’ with sub string ‘xyz’ . From then above screenshot you can observe that, it is not replacing anything (String_Object is unchanged). Lastly, we used the System.out.println statements to print the output as shown below.